A few days ago Warren Watson seemed to be a mysterious individual who left little record of his life. Hooyah! Shortly thereafter, in came a picture of the seed that was rumored to exist! It was a start, a darned good start~ Still, there had to be more to the story and I was left scratching my head. This changed abruptly when I received an email from one of his descendants. 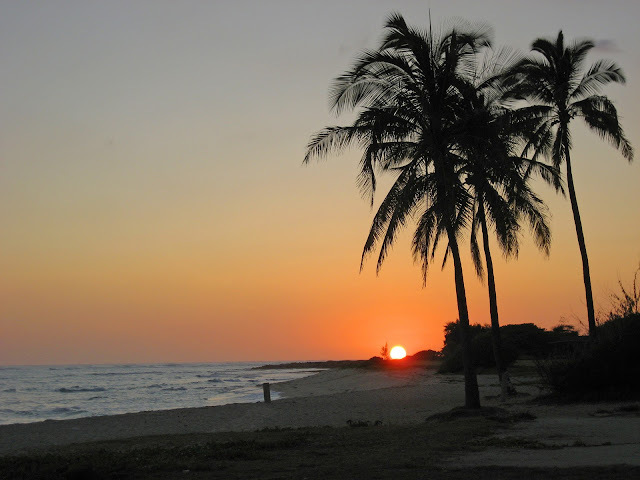 The information provided sheds considerable light on the man and his life. Warren Mortimer Watson was born August 24, 1845, in Rochester, Monroe Co., NY, and died May 6, 1913, in Alameda Co., CA, at age 67. He is the son of William Watson of Ireland and Abigail Harrington of New York. Buried in Mountain View Cemetery, Oakland, Alameda County, CA. The following names are on the same cemetery marker: Warren M. Watson: 1845 - 1913; Emma Pearl Watson: 1851 - 1880; John W. Watson: 12/3/1825 - 3/16/1896; Emily M. Watson: 1845 - 1974. Warren M. Watson and Emma Pearl Howe were married January 5, 1869, in California. They had no children. Emma died February 29, 1880, in Brooklyn Twp., City of Oakland, Alameda Co., CA, at age 29. After Emma died, Warren M. Watson married Margaret Elizabeth "Maggie" Watson in 1881 in Oakland, Alameda Co., CA.. "Maggie" was born November 17, 1862, on Bear River near Marysville, Yuba Co., CA. They too, had no children. 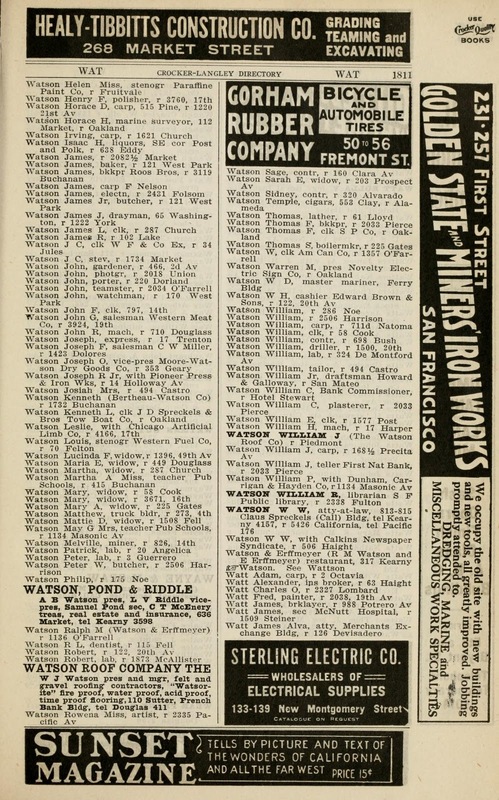 The 1880 U. S. Census taken on June 11, 1880, shows Warren Watson (age 33) born in New York to English and New York-born parents is a Cigar Maker and is living at 716 9th Street, City of Oakland, Alameda Co., CA. Living with him but with a line through the name is his wife, Emma Watson (age 30) born in Massachusetts to Massachusetts-born parents, who is Keeping House, with a note saying died Feb. Also living there: his widowed mother-in-law: Orvilla How (age 59) born in Massachusetts to Massachusetts-born parents; and Maggie Watson (age 17) born in California to Missouri and Kentucky-born parents, an unmarried Servant. OAKLAND. April 21. - W. M. Watson, who has been the head of the W. M. Watson Company, one of the largest wholesale liquor firms in Oakland, has turned his company into a stock concern, and left this week for the Paris Exposition and a trip around the world, accompanied by his wife. Mr. Watson has disposed of his business to a number of his employes and his nephew. Those who now control the company are: C. T. Lemmon, Mr. Watson's nephew; J. J. Carroll of the Louvre. T. W. Sigourney, who has been the head of the store for many years; L. S. Farr, who has been the head bookkeeper, and P. O'Kane, the chief outside man of the company. Mr. Watson retains only a small Interest. W. M. Watson has 'always been one of the leaders in Oakland business circles and has been at the head and front of all moves for the benefit of the city. He will be gone abroad for more than a year. Warren Watson, the well-known wine man of this city, is to make another tour of the world. This will be the fourth time that he will have circled the globe. He will be accompanied by his wife. The passports, signed by Elihu Root, arrived today. Mr. and Mrs. Watson shall sail from San Francisco on the 27th of this month on the steamer Manchuria. 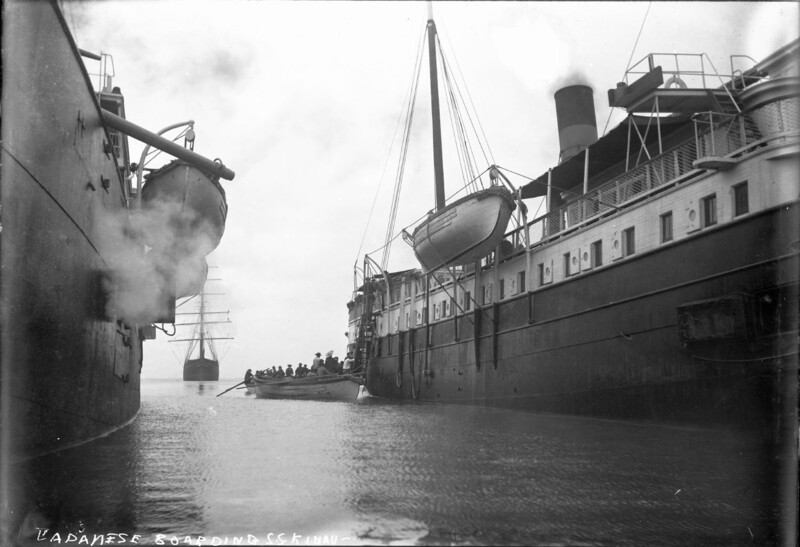 They will visit points of interest which have heretofore not received their attention while abroad, and expect to have, as fellow passengers, Mr. and Mrs. W. J. Bryan and family. APPOINTED ONE OF YOSEMITE COMMISSIONERS BY GOVERNOR PARDEE. Warren W. Watson, who was, for so many years, in the wine trade in this city but who has retired from business, and who now spends his winters in San Francisco and his summers at his country home near Pleasanton, in this county, received his commission today from Governor Pardee as a member of the Board of Commissioners to manage the Yosemite Valley and Mariposa Big Tree Grove. The appointment has been made to fill the vacancy occasioned on the Board by the death of the late Hon. W. W. Foote, of this city. 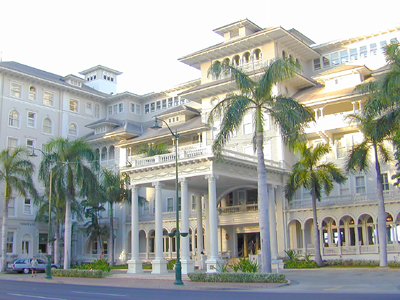 It is a coincidence that John H. O'Brien, formerly Mr. Watson's partner in business, held the position to which the latter has been appointed, for fourteen years. 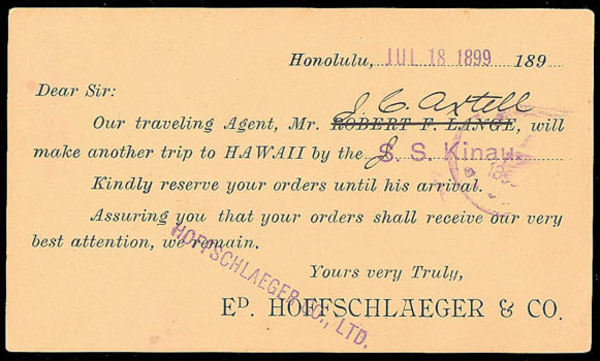 Mr. Watson is pleased with his official position, more especially because his preferment takes place on the eve of his departure with his wife on his fourth trip around the world. Warren Mortimer Watson in 1906 is listed as a Royal Arch Mason in the Alcatraz Chapter No. 8a, Oakland, Alameda Co., CA. 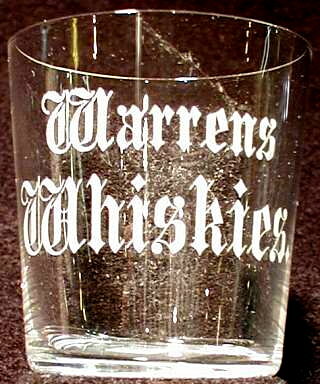 Warren Mortimer Watson on July 1, 1910, is listed as a member of the Ancient and Accepted Scottish Rite List of Members in California.The 1910 U. S. Census taken on April 15, 1910, shows Warren M. Watson (age 64) born in New York to Irish and New York-born parents and in his first marriage is a Retired Capitalist who owns his own home free of a mortgage and is living at 1314 8th Avenue, 7th Ward, Brooklyn Twp., City of Oakland, Alameda Co., CA. Living with him is his childless wife of 29 years, Margaret E. Watson (age 48) born in California to Kentucky and Missouri-born parents and in her first marriage. And lastly; Warren Mortimer Watson died May 6, 1913, in Alameda Co., CA, at age 67. Bob Barnett listed #816 " Kentucky Club Old Bourbon" in clear with both tooled and applied tops, cork closure, ca. 1892 - 1905; #817 "W. M. Watson Co. / logo / Oakland, Ca." amber square tooled cork closure / squat with swirled shoulders ca. 1906 - 1914; #818 "W. M. Watson Co. Inc. / logo / Oakland, Ca." amber tooled bulge neck qt. cylinder / brandy top cork closure/ ca. 1900 - 1905; #819 "W. M. Watson Co. / logo / Oakland, Ca." amber square tooled bulge neck qt. cylinder / brandy top / ca. 1900 - 1908; and #820 "W. M. Watson Co. / logo / Oakland, Ca." 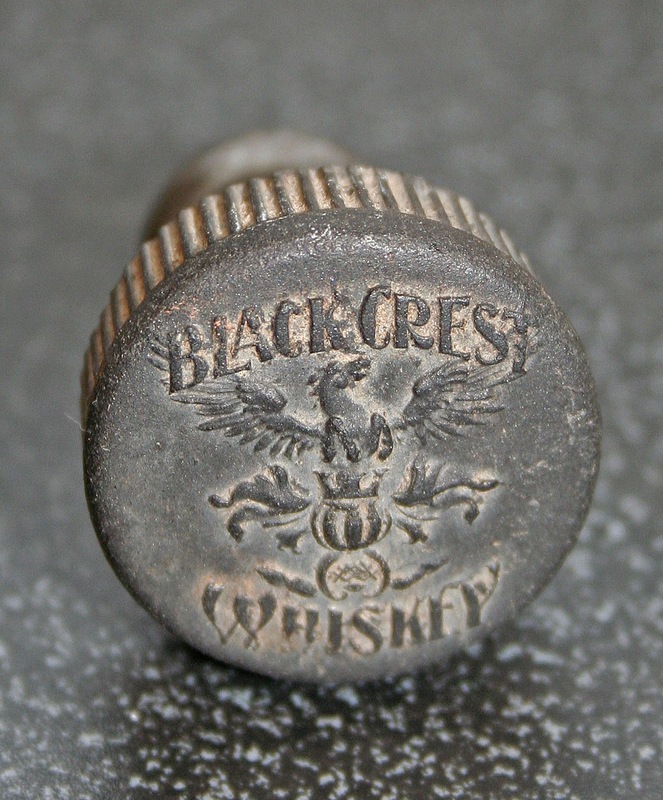 amber tooled fifth cylinder / whiskey top cork & IT closure/ ca. 1900 - 1908. OK, let's sort a couple of things out. 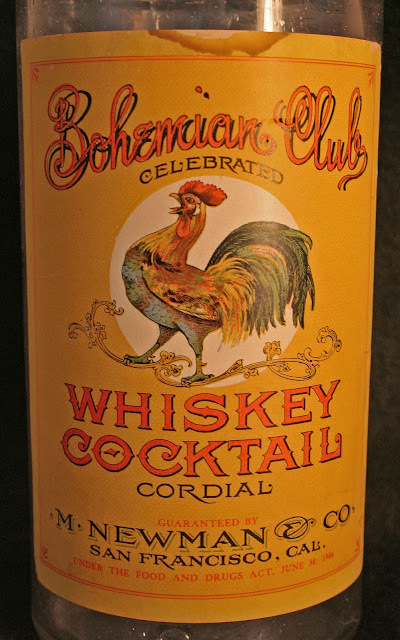 The Kentucky Club is probably dated correctly and falls into the German Connection glop top time line nicely. Common sense says that the three variants that are embossed minus the "Inc." would be earlier so I'd plug them in ca. 1900 - 1905 +/-. The last in the lineup would logically be the variant embossed "Inc.". The Kentucky Club Old Bourbon bottles are extremely scarce, with the glop tops being encountered in a ratio of probably 15 - 1 compared to the toolies (not that there's many of either). Let's face it, The tool tops are just plain rare with fewer than a half dozen known to exist! And they will turn amethyst, which for us old time purists who still like honest sun colored glass, is a big plus. Next in scarcity and desirability is the square swirled shoulder. The shape is distinctive and attractive. 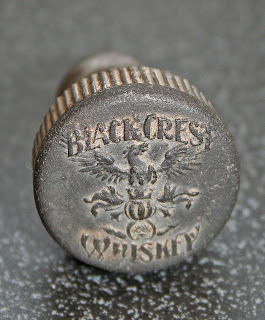 The cylinder fifth is also scarce, and ones with the correct Riley inside thread picture stopper for Black Crest Whiskey are an especially tough score. The bulge necks are seen slightly more often but are still no slouch in the tool top world. 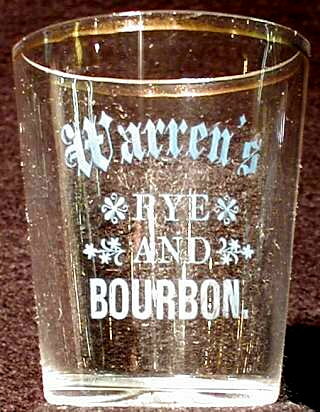 He also had three etched pre-pro shot glasses produced; one each for Warrens / Whiskies, Warren's Rye and Bourbon, and one for Warren's O.K. 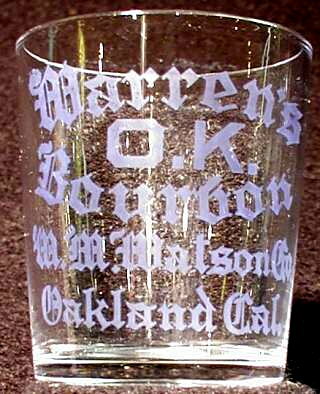 / Bourbon W. M. Watson Co. / Oakland Cal. All are scarce. A note in the 1899 Oakland Social Register reads, "WATSON, Mr. and Mrs. W. M.; 658 Ninth. (Tel. Red 2351.). Thursday." Located in plot 13 of the Mountain View Cemetery in Oakland is a simple head stone engraved Warren M. Watson 1845 - 1913. And here's where our plot thickens and the trail goes cold. These two references are the only hard documentation I could find that Warren M. Watson ever existed; no date of birth or death, no birthplace, no business address, no occupation; no nothing! Nothing more in Oakland, nothing in Brooklyn, nothing in Alameda, nothing in Emeryville, nothing across the Bay in San Francisco; simply nothing! 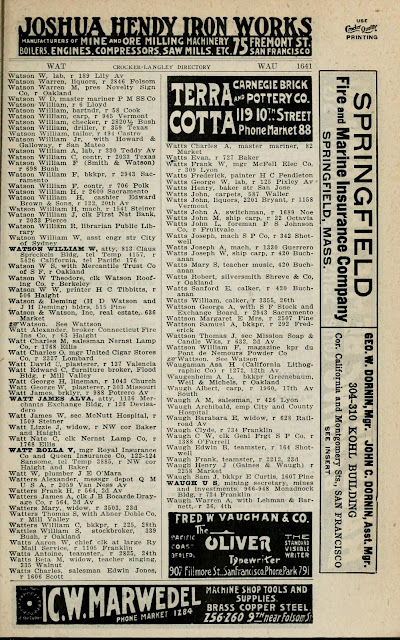 Accessing archives of business directories, phone books, and newspaper classified ads invariably pays off with "the rest of the story". Not in this case though. 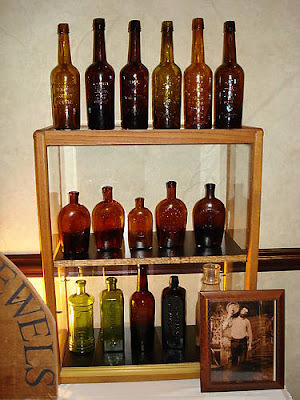 The bottles remain as mute testimony to Warren M. Watson, but everything else remains shrouded in the mists of time. 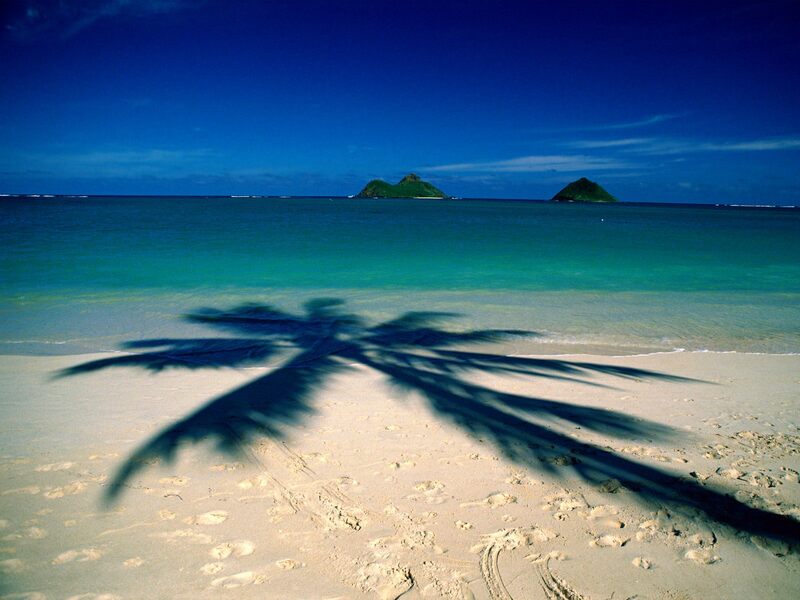 Talk about disappearing without a trace. A special thianks to Ken S. for the shot glass photos! 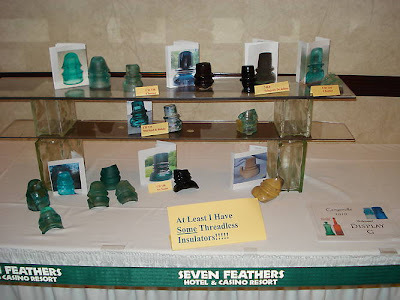 This was our 8th year at the Seven Feathers facility. Nervous; (maybe, as the economy appeared to be a formidable hurdle). 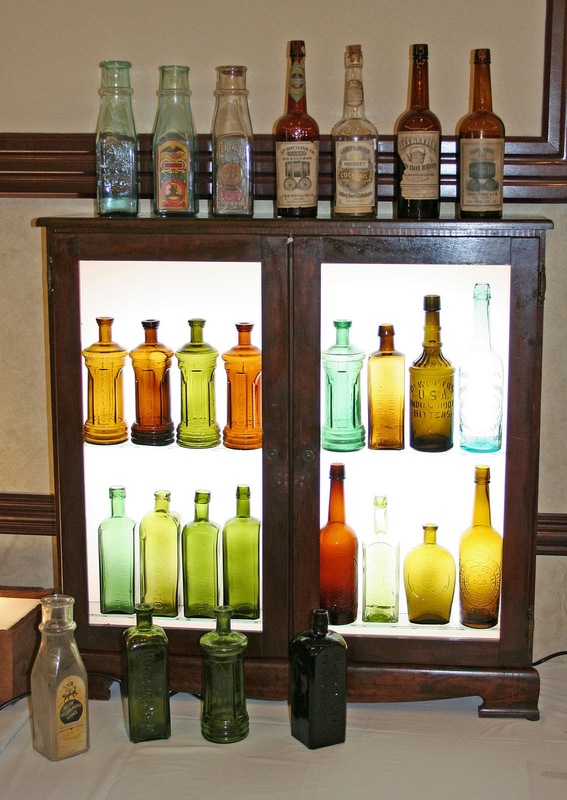 October 15th and 16th; The Jefferson State Antique Bottle & Insulator Show in Canyonville, Oregon. Approaching, slowly in the distance. Gathering speed as it neared. Closer. Faster. Blasting, billowing, bursting forth, with the power of ten billion butterfly sneezes (Ok; I stole that line from the Moody Blues). The show opens to one and all at twelve noon sharp. But, the dealers rolled in early; nine am and change. Can't blame 'em. Fortunately, to everyone's delight, the tables are arranged, linens are in place, and table drapes installed. A fancy setup! But what gives? 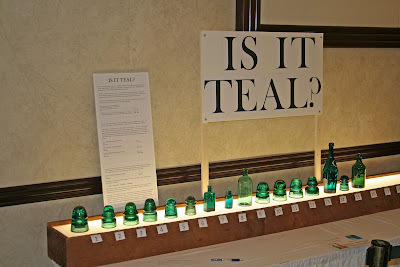 Is this a wedding reception or a just good ol' fashioned Antique Bottle & Insulator Show? Now that you asked, it's a little of both. 'Cause Antique Glass is just that, regardless of the form! And, as such, this annual get together is simply a marriage of two hobbies. And so, dealers stuffed their wares under the tables, and "early birds" swapped stories (and lies) with the rest of the gang while waiting for the magic hour. The long and short of the show? We had to turn away last minute dealers. A sellout. Early admission was up; way up, over prior years. Rather than elaborate on first day sales I'll suffice to quote one dealer and say "way better than I hoped for". Most all reflected the same. 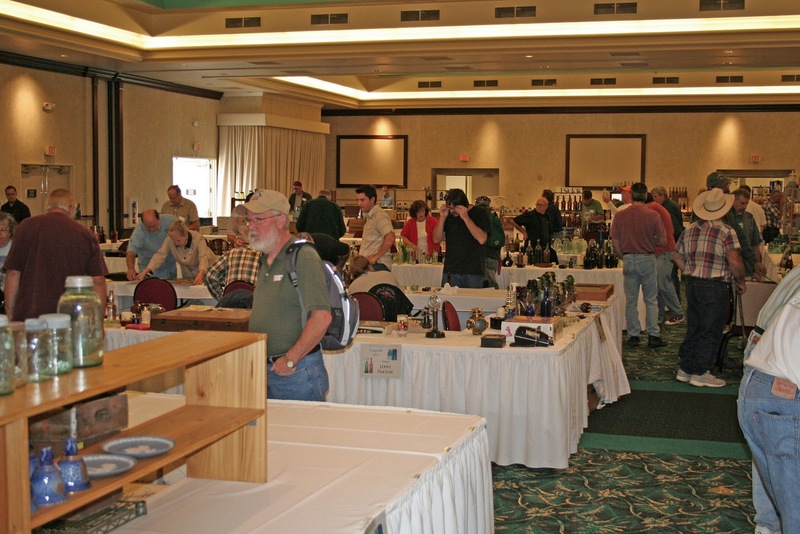 True, a lot of first day sales are dealer to dealer; but early admission also accounted for a lot of out of state collectors and a pretty hefty chunk of purchases as well. Saturday is normally a different story; with an excitement level akin to watching paint dry.Not this year, as the advertising blitz that Scott had undertaken obviously paid off in spades! 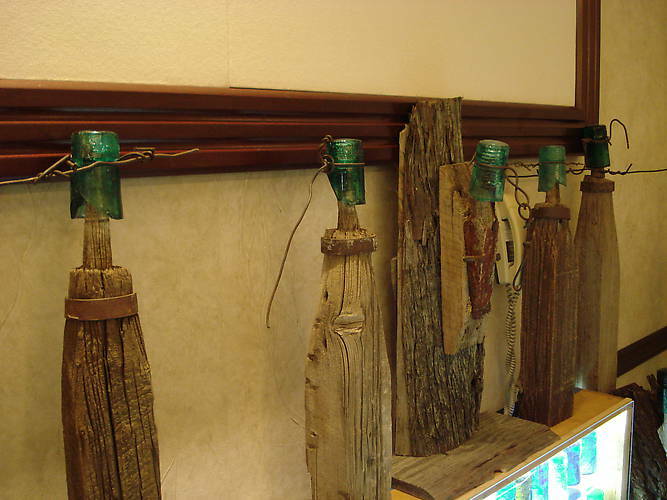 Locals, locals, and more locals continually streamed in the door from surrounding towns and burgs. 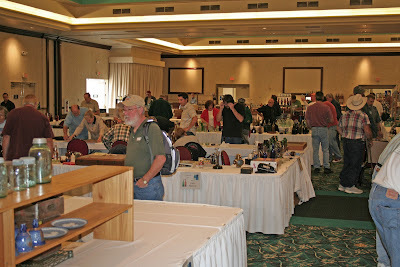 And they brought in stuff, lots of stuff, to have appraised and to auction off. 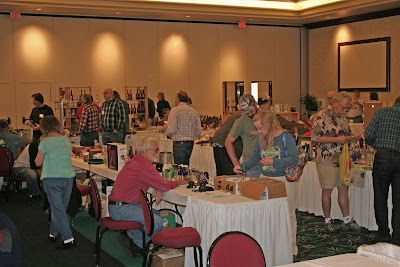 Dale and Jeff were kept a hoppin' appraising and bundling offerings for silent auction. 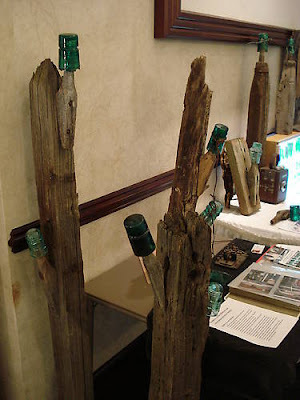 Collectors and dealers alike were treated to an endless array of bottles insulators and go withs to bid on and the auction table was jammed until we just plain ran out of time. Then there were the displays! Lots of displays. 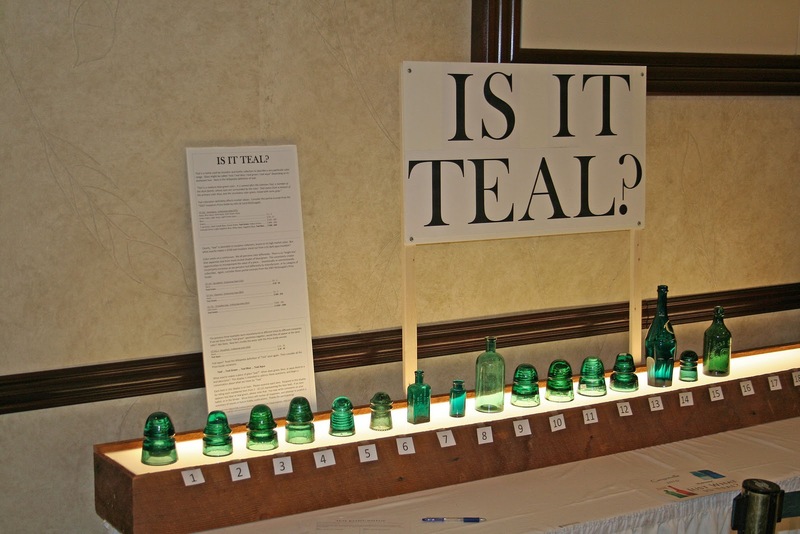 Categories ranged from the open entry Pacific Coast Jewels (top west coast bottles), to "Is It Teal" (insulator open category comparing colors), to veterinary pharmaceuticals of the 19th century. 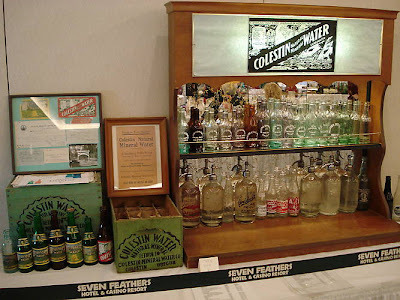 Also appearing were EC&M / Cal Electric insulators, threadless "battered beauty" insulators, a regional Jackson County display, and, not to be left out, west coast picture whiskies. We jokingly commented that the value of glass in this years displays no doubt approached what the Seven Feathers facility had in their vault. Talk about high end glass! Ah, the age old question; "What sold"? Simply, everything. It didn't seem to matter where your table was located, or what you had on it, "stuff" just flat sold. 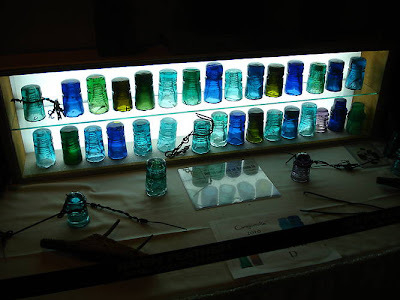 Unlike a lot of shows, this years theme was "no crystal ball required" when it came to exchanging glass for cash~ My kinda show! And there was the weather... We couldn't have asked for a better fall weekend. Cool and overcast early on, breaking to bright sun and crisp blue skies around noon. And the fall colors were at their peak! Good friend, Warren Friedrich, has completed his manuscript for the definitive work to date on California’s early glass houses. Entitled, Early Glassworks of California, it is a hard cover book on high quality heavy gloss paper with sewn binding. 233 pages with 287 illustrations, it features original 19th C. ads and articles. There will be only one printing! Destined to become a "go to" book for all collectors of western glass, it is available by advance reservation only. Warren will be at the Canyonville Show on Friday afternoon and evening, October 15th, to accept pre-printing reservations. Back in the 19th century, a pretty good percentage of the miners, loggers, railroad men and other components of the working class couldn't read well, if at all. Brand recognition then, as now, was ever so important if one was going to get his slice of the pie. Let's face it, everyone in the West Coast liquor business needed an edge to survive in business. 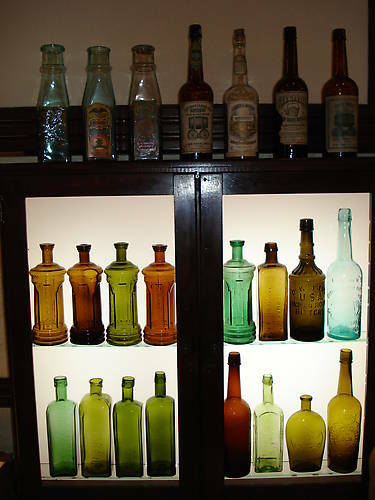 Around 1870 two competing companies decided to have bottle molds made that would allow pictures to appear on the glass, instead of just on the label. Shea, Bocqueraz and McKee were slugging it out with John Van Bergen for their share of the market. Shea, Bocqueraz and McKee was marketing the Tea Kettle brand, which was distilled at a distillery in Trimble County Kentucky, casked in wooden "hogsheads" (oak barrels), shipped west on the transcontinental railroad and then bottled in San Francisco. 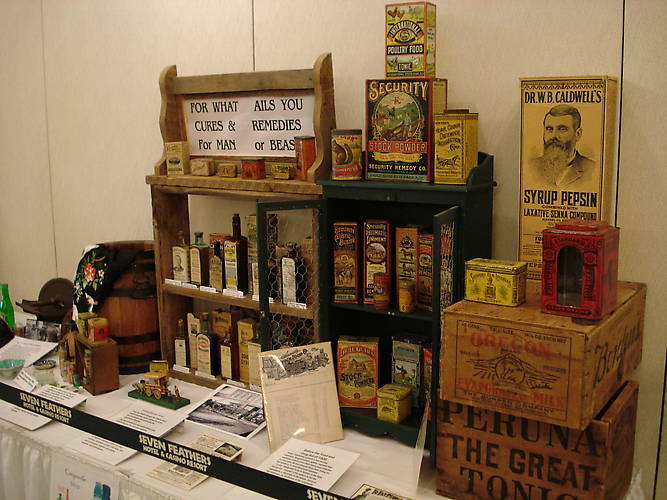 Tea Kettle was a nationally recognized brand of good affordable whiskey and sales were phenomenal in California and Nevada. 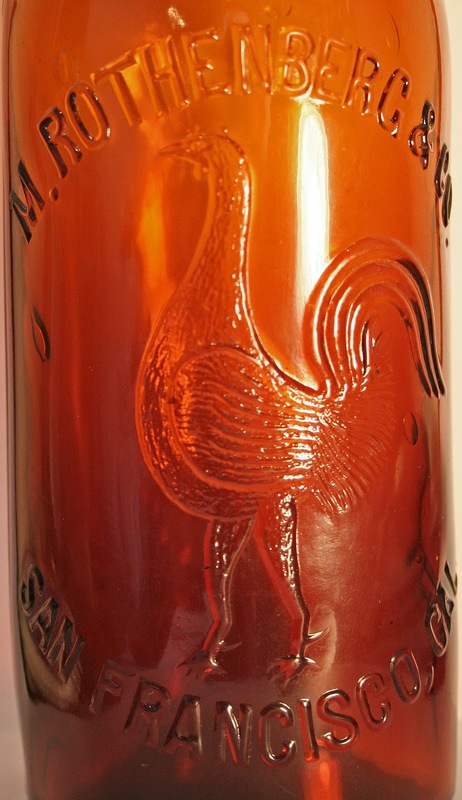 Van Bergen's "Gold Dust" brand was named after a famous race horse that was known and loved from coast to coast and they figured, rightfully so, that they too could grab a big chunk of the market share by selling good affordable whiskey with a recognized name and picture embossed on the bottle. 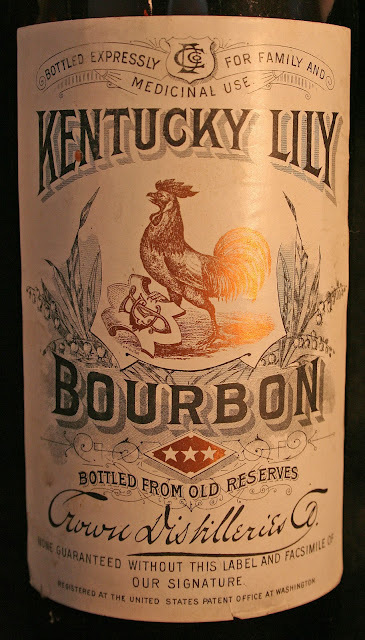 Next in the line of picture whiskies was the Pioneer brand sold by Fenkhausen & Braunschweiger. This is called the "two name bear" and first came on the market around 1878. 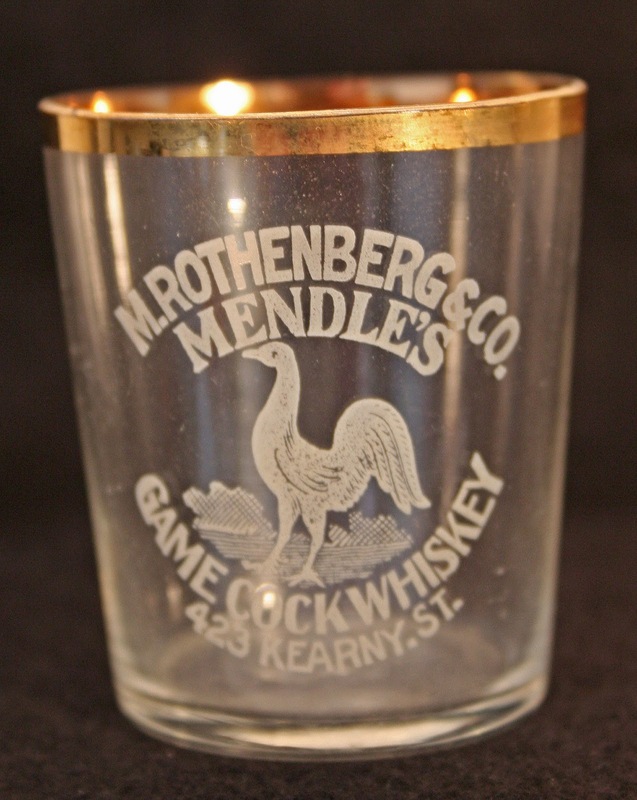 In 1881 Braunscheiger left the business to go it alone and the mold was reworked to reflect Fenkhausen's sole ownership. But Braunschweiger, not to be left in the dust, came back in 1883 with his Bear Grass brand, again depicting a bear on the bottle. The mold was carefully designed to look entirely different from the bear on the Pioneer, but it was a bear nonetheless, and I'm sure this created more than a little friction between the two companies. Regardless, both prospered for a number of years with Fenkhausen remaining a presence through 1893 and Braunschweiger making a go of it through 1913. Again a number of different molds were employed over the years with the bear remaining a constant fixture despite the passage of time. This is the tip of the proverbial picture iceberg. Come see the "rest of the story" at the Jefferson State Antique Bottle, Insulator and Collectibles Show & Sale located at the Seven Feathers Casino Resort (I5 exit 99) in Canyonville Oregon, Saturday October 16th. 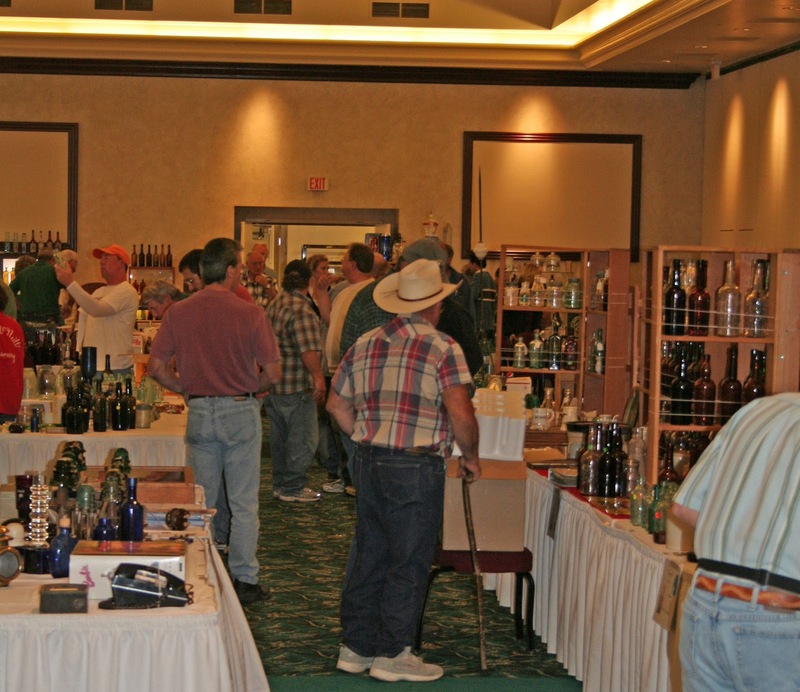 There will be well over two dozen of some the West's most prized tooled and glop top picture whiskies on display!